This dish is something that I've been wanting to make for several months. 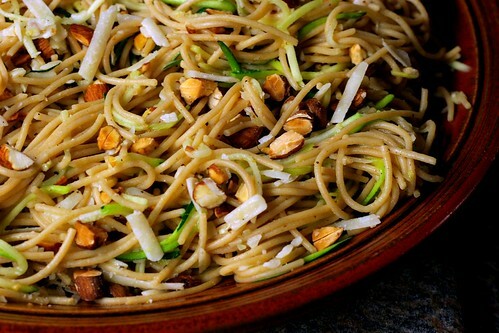 In the early fall, I got the idea to julienne zucchini lengthwise into long, thin strips and toss them with spaghetti, lemon, nuts, and Parmigiano. I went to the farmers' market all excited to try it out...only to find that zucchini had gone out of season that very week. So I resigned myself to the idea that I'd have to wait until next summer to make the dish. However...I've recently decided that for the winter, I'm going to expand my definition of local food to include ingredients that are produced regionally - that is, anywhere on the East Coast. This gives me some more variety in vegetables, although I'm still buying as many Massachusetts-produced ingredients as I can. I'm also still buying all my produce and meat from the farmers' market so that I have a connection with the people that grow the food, even if the food is coming from a different part of the East Coast. One of the vendors at the local winter farmers' market sources produce from Florida, and they were selling zucchini this week, so I decided to finally try making this dish! Cook pasta in well-salted water until al dente. Reserve 1 cup pasta cooking water, then drain pasta. Heat a splash of olive oil in the pasta cooking pot over medium-high heat. Add zucchini and cook for 1 minute. Remove pot from heat and toss zucchini with pasta, lemon zest, lemon juice, almonds, cheese, and pepper. Add pasta cooking water as necessary to loosen the pasta. Salt to taste, and serve with extra grated Parmigiano-Reggiano.